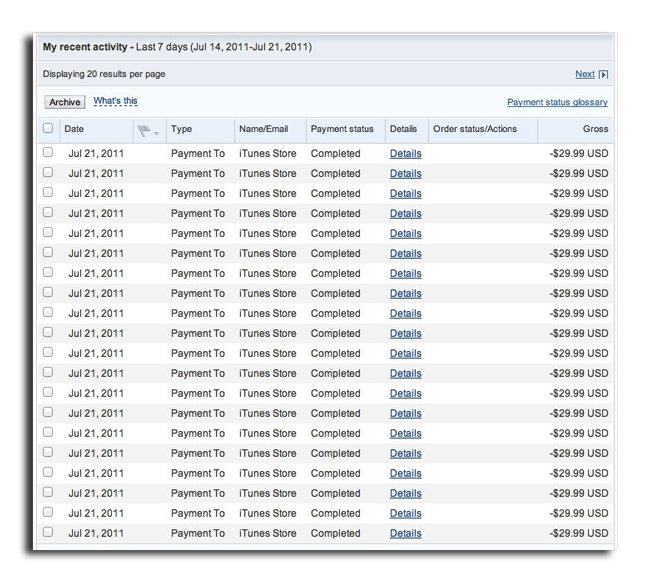 Multiple PayPal users have been incorrectly charged for purchasing Mac OS X 10.7 Lion from the Mac App Store numerous times, with one user claiming to have received a bill of nearly $4,000 for the $29.99 software. One customer who contacted AppleInsider on Wednesday said they were charged $3,878 on July 28 in a series of 122 separate charges for $31.79 each. They said they reached out to Apple but have not been able to secure a refund. "Apple blames PayPal, PayPal blames Apple," they wrote in an e-mail. "They both are claiming to investigate, but I am stuck broke for three days now." The story is bolstered by a growing thread on the official Apple Support Communities, filled with users who have also seen multiple mistaken charges for Lion. The thread was started by user "abhas," who found they were charged by the iTunes Store 20 times for Lion, leaving them with a bill of $599.80. The problem seems to lie solely with users who have a PayPal account connected to their iTunes Store account for payments. Some who contacted PayPal said they were told that the multiple charges were made by the iTunes Store, while Apple has insisted to some that the iTunes Store only charged ones. "I just got off the phone with PayPal," user "JustinIowa" wrote. "They said that even though Apple has refunded the balance and it shows that in my PayPal account, that they will not refund the money back to my bank account. It will wait until it withdraws the full amount from my bank balance, then it will be refunded to my PayPal balance." Some reported that they have been hit with overdraft fees and other charges because of mistaken multiple charges. Some have also been left waiting days for the refunds to reappear in their PayPal accounts. "App Store agents have told me this is now a known issue and Apple is investigating the specific causes," user "teknikks" wrote on the Apple forums. "So far they can only blame an overload in their automated payment system from all the Lion downloads." Currently available only on the Mac App Store, Lion got off to a strong start last week, topping a million downloads in its first day of availability. That's the fastest start of any operating system in Apple history. The switch from disc-based operating system installs to the Mac App Store did result in issues for a handful of users who experienced problems updating their systems to Lion. But by all accounts those issues have been rare, as 14,772 customers on the Mac App Store have given Lion an average score of four-and-a-half stars out of five.